Of course almost nothing about this project is normal, and the excavation process is no different. This work would typically be done with the help of some heavy machinery, but our site is so crowded that even a “mini excavator” is too large to do us any good. So instead we’re relying on some old-fashioned manpower to get the job done. The digging is being done by a team of 6 men using a small jackhammer (to break thru some sub-surface concrete,) 3 hand shovels, and an army of 5-gallon buckets that are being used to shuttle the dirt over to a nearby pickup truck. And boy, are they moving! 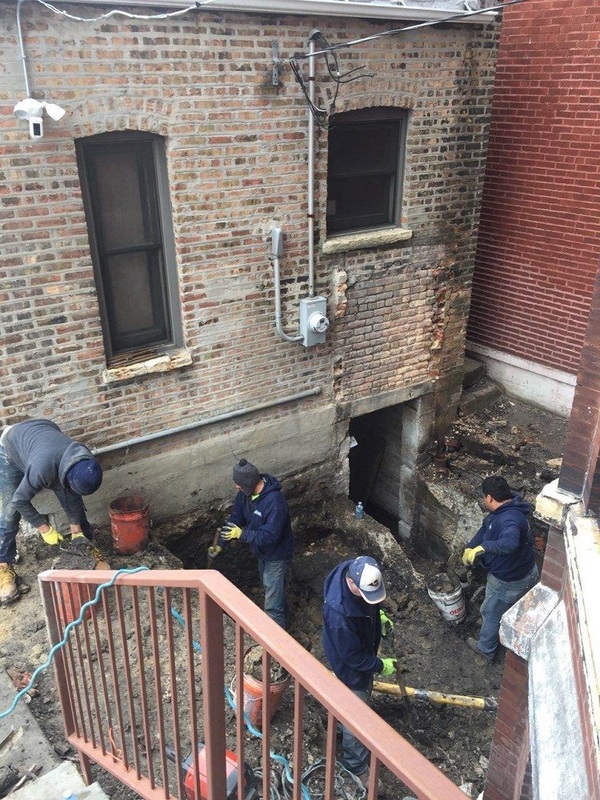 In just two days this team has excavated roughly 80 square feet to a depth of 7-feet below ground, while carefully avoiding a marked gas line nearby & a century-old clay-tile sewer line that was discovered at a depth of 6 feet. Now one of the unwritten rules of construction is that whenever it’s time to dig a hole, it’s gonna rain. Today was no exception. With the excavation team approaching the 6-foot mark (1 more to go!) the skies opened up. Not just a little rain, … all. the. rain. What was already a soggy worksite quickly became a slippery, muddy pit. Luckily, they had a plastic tarp on-hand for just this kind of situation, and used to scrap lumber to construct a temporary tent over the workspace.